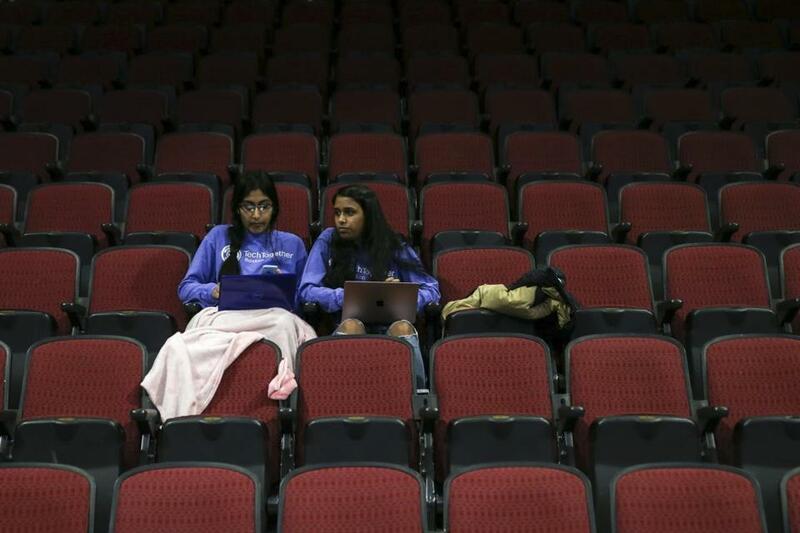 Mansi Gera (left) and Rhea Verma work in a seating section of the Agganis Arena during the TechTogether hackathon. The technology sector doesn’t have the best track record when it comes to the treatment of people who aren’t straight white men. Uber settled a lawsuit last year over allegations that women and minorities employed by the ride-service company faced harassment and discrimination. Last fall, The New York Times reported that Google protected three executives accused of sexual misconduct, prompting a nationwide walkout by employees. By contrast, there hasn’t been much research and reporting on what the sector is like for members of the LGBTQ community, especially those who identify as transgender, nonbinary, or gender nonconforming. But the anecdotal evidence is discouraging. “If you think being a woman in tech is hard, try being nonbinary in tech,” Lianna Newman, a software engineer in Washington, D.C., said. Newman, who identifies as nonbinary and does not use pronouns, described workplaces that were uninviting or outright hostile to nonbinary people. But there are efforts to make the sector more inclusive of those who don’t adhere to strict gender norms both in the United States and elsewhere. Some of that work is happening in Boston. TechTogether hackathon participants filled the floor space of the Agganis Arena. 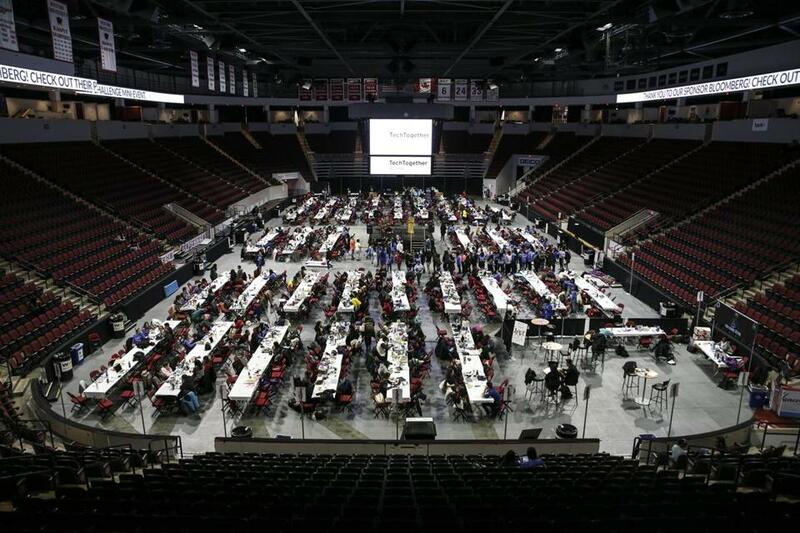 A recent hackathon billed as TechTogether Boston drew about 600 participants to Boston University’s Agganis Arena. In 2018, the first year the event was held, it was called SheHacks, and marketed heavily toward women. This year, organizers opted to remove “she” from the name and promote the event to equally to women and nonbinary people. “We did have a very long conversation about what our policies are, how can we make the event more inclusive,” founder Fiona Whittington said. Ultimately, organizers decided “she” was not representative of all of the people they wanted to feel welcome. Logistics were also taken into account. This year’s event had gender-neutral bathrooms; last year’s didn’t. TechTogether isn’t the only event trying to carve out a space for transgender people in tech. Last year, a conference held in England called Non-Binary In Tech welcomed nonbinary people who were interested in the tech scene, while a summit held last March in San Francisco, called Transform Tech, focused on ways to make the sector more inclusive for transgender people. And an event called HackHer413 billed itself as the first hackathon in Western Massachusetts exclusively for women and nonbinary people. Anuva Kalawar, communications manager for the international advocacy group Out in Tech said efforts to make tech more inclusive largely originate with transgender, nonbinary, and gender nonconforming activists. 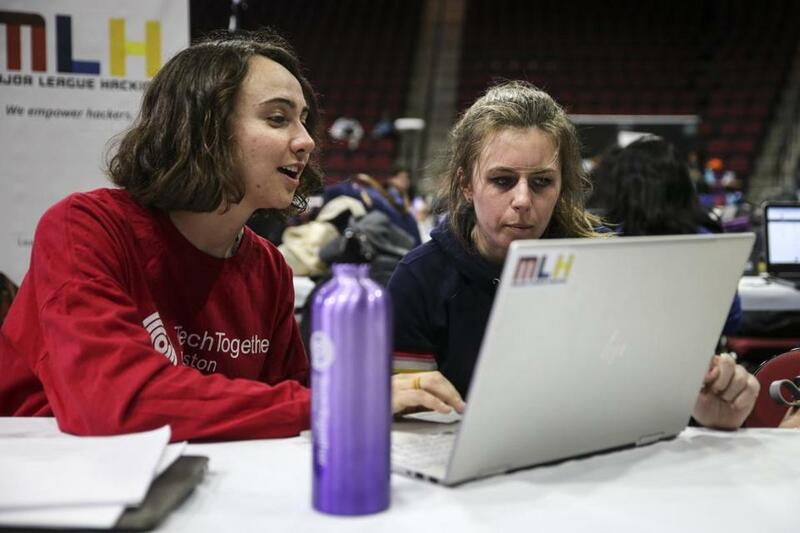 Rosalind Ellis (left) assisted Tessa McNeil, a student at BU, on a coding project during the TechTogether hackathon. As an example, Kalawar cited an entrepreneurship panel for transgender, nonbinary, and gender nonconforming people put together by Out in Tech at Google in Washington, D.C.
Newman, the software engineer, heads the organization’s D.C. chapter and participated in that panel. Newman said it provided attendees with a better idea of how to navigate the workplace and the tech sector at large. “A lot of people appreciated it,” Newman said. Retention can prove challenging in an industry that has a reputation for being unwelcoming to outsiders, according to Michelle Glauser, founder of the nonprofit Techtonica, which provides training and job-placement services for women and nonbinary people in the San Francisco Bay Area. Glauser said her organization also runs inclusion workshops for employers. A sticker reading "Girls Support Girls" on the laptop of a TechTogether hackathon participant. Newman’s experiences seem to reflect that. But even though the industry remains a challenging place for nonbinary, transgender, and gender nonconforming people, Out In Tech’s Kalawar believes advocacy and activist groups are making a difference. “We’re going to see the industry change, but [tech companies] need support from advocacy groups,” they said.